Enclosed power unit or unenclosed standard unit. Linking header lines to cylinders and power pack to header lines, completely bound and shrouded for double line in a single hose. C/W connectors pre-fitted. For years of maintenance free and leak free performance. Pre assembled for center, end, and in-line connection. And tested upper pinpoint, safety factor greater than a factor of 3. Complete with BS steel pins and sintered insert bearing for extended life and reduced service requirements. Fixed tube frame and attach angle for inside, outside or flush mount to wood, steel or brick structures and buildings. Base plate and floor attach should this be a requirement. For attachment of insulation or inside skin/cladding. Spaced according to your wind loading requirements (90 MPH Standard). Up to 200 MPH upon request. Bespoke for your door size and loadings, double sealed for reliability and periods closed to avoid dehydration and deterioration. Pin and bearing assembly. Industry leading sintered iron insert bearing for extended life beyond 5 years with zero metal to metal contact, no grease required. Weld free complete with lok-tite bolts for a lifetime of secure connection. 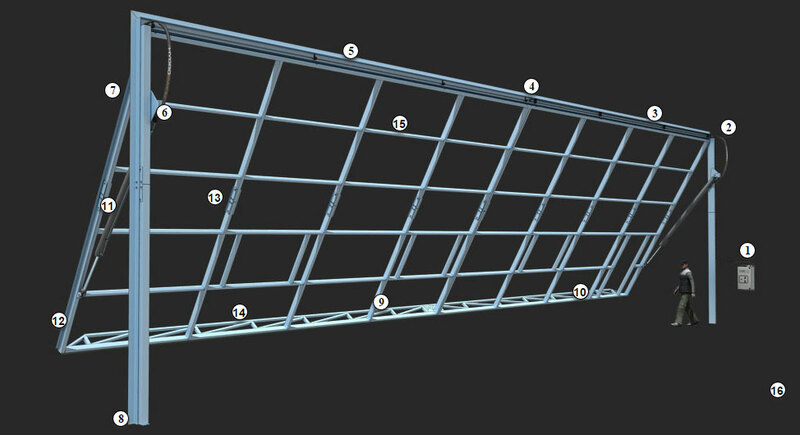 Industry leading for strength with sizes up to 150' wide possible in single panel. For unlimited finish attachment and window openings upon request provided. Walk door opening inclusive, simply specify left, center or right. Paint system, light gray as standard applied to ISO 9001 standards with inspection certificate.